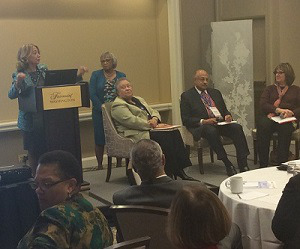 Dr. Mildred Garcia makes remarks as Dr. Mary Evans Sias looks on with panelists Drs. Belle Wheelan, George Pruitt and Barbara Gellman-Danley. 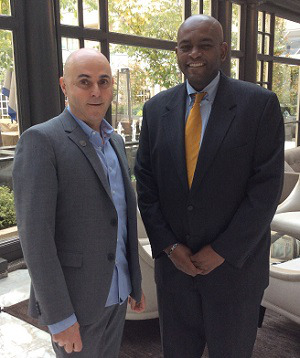 WASHINGTON – Demand exceeded expectations Monday when 89 higher education leaders from underrepresented populations registered for the Millennium Leadership Initiative (MLI) gathering at the annual meeting of the American Association of State Colleges and Universities (AASCU). MLI director Dr. Mary Evans Sias had hoped for 50 attendees at the 20th annual fall symposium, themed “Own Your Future: How Will You Lead?” But interest was so high in the selective leadership program, which was created to diversify the ranks of college administrators, that she made arrangements to accommodate the 78-percent increase. MLI’s data-driven pipeline efforts continue as higher education sees a continued rise in the percentage of students of color, a decline in the perennially small percentage of minority faculty and administrators, and the advent of a season when the majority of current college and university presidents will retire within seven years. Preparing leaders from underrepresented groups means a big dose of reality and helping them understand what to expect, said Sias. Ten Black presidents of colleges and universities established MLI in 1999 out of concern about a dearth of minorities in the administrative ranks of higher education. The eight men and two women quickly attracted the support of like-minded academics and grew the organization, later coming under the auspices of the AASCU. Since MLI’s inception, 570 participants have graduated, with 104 having held 134 presidencies at a range of colleges and universities. Others have gone on to various high-profile positions inside and outside the higher education sector, including ambassadors and chief executive officers, Sias noted. In fact, AASCU president Dr. Mildred Garcia, an alumna of the first cohort, was the first program graduate to become president of a school. The extensive leadership-development program includes structured components such as reality-based case studies and this week’s two-day gathering, which featured sessions such as characteristics of effective trustees, president-board relations and solutions to ensure HBCU sustainability. In a panel discussion Monday about how accreditation and governing boards can work together to improve a school’s outcomes, leaders were advised to confide in and consult with their respective accrediting commissions so that they can best serve students and keep their doors open. Loss of accreditation – often brought on by financial mismanagement or deep board-administration conflict – usually spells the demise of a school, a peril of particular relevance now to some HBCUs, panelists noted. Dr. George Pruitt, president emeritus and Board Distinguished Fellow at the Center for Leadership and Governance at Thomas Edison University, said the accreditation and review processes have become more evidence-based and fair, and schools can navigate them better when they place student interests ahead of protecting the institution. In an era when the federal government has invested huge sums in financial aid and “wants to know what they’re getting for their money,” schools seeking re-accreditation must focus on the primary evaluative criteria of student completion rates, job procurement and loan repayment, said Dr. Belle S. Wheelan, president of the Southern Association of Colleges and Schools Commission of Colleges. To gain re-accreditation, a president must understand the process, plan a strategy and communicate honestly and effectively with trustees. “People will circle the wagons to help, unless they’ve been kept in the dark,” said Dr. Barbara Gellman-Danley, president of the Higher Learning Commission. And rather than waiting until the last minute to prepare for that critical site visit by a team from the accrediting agency, Wheelan added, work on preparing over time and have annual progress reviews. In addition to regional meetings twice a year, MLI gives participants ongoing support in the form of a coach who is a former president or provost, a mentor who is an active president or provost and related experiences such as campus visits and job-shadowing. Dr. Douglas Luke, who graduated last year, said MLI changed his life. Luke and his mentor, Westfield State University president Dr. Ramon S. Torrecilha, are both first-generation college graduates and have continued their mentoring relationship. Torrecilha was executive vice president of Mills College when he graduated from MLI in 2011, and three years ago became president of Westfield State.